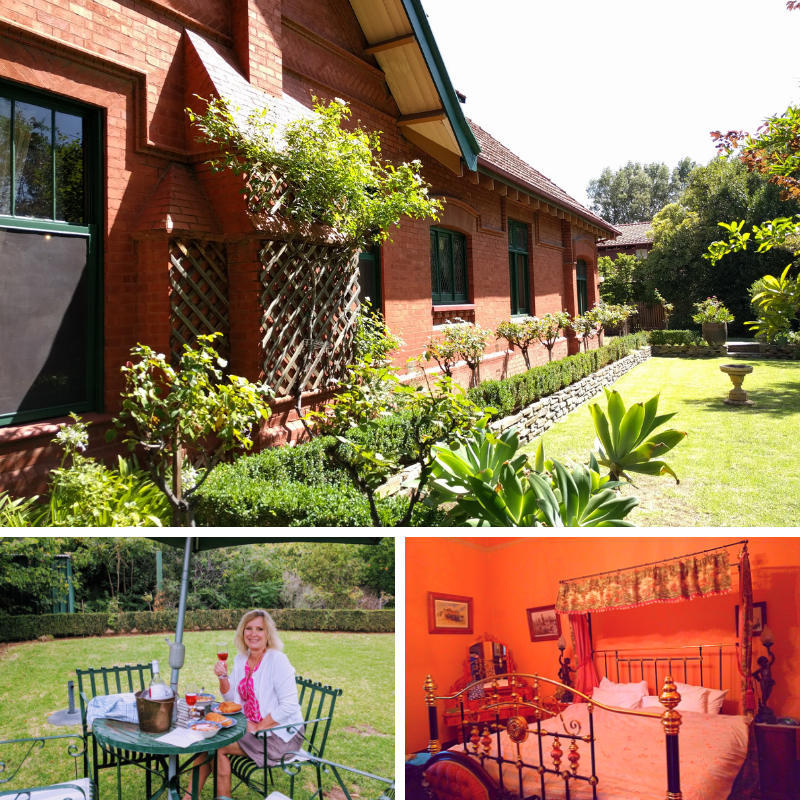 A historic manor, splendorous gardens and rare wildlife delight during our Australian visit. The final city on our recent Australia trip was Adelaide. Adelaide is the capital city of South Australia. Unlike other Australian cities like Melbourne, Sydney and Hobart, Adelaide was established as planned colony of free immigrants. Today it is noted for its food and wine, long beachfronts and highly rating as one of the world’s most livable cities. Our accommodations in Adelaide were the most unique of our trip – Buxton Manor. Buxton Manor is a restored 1909 red brick mansion that has been converted into a bed and breakfast with four large apartments and one cottage. We stayed in the Musica Viva apartment, which features a large drawing room that was formerly the gentlemen’s billiard room. With lofty ceilings with polished timbers, spruce floors and elegant antiques this was a just the tonic needed for harried travelers. The bedroom features a canopied antique double bed and is decorated with silk tapestries and Australian arts and crafts antiques. We also enjoyed the half-acre grounds that included a nice backyard with a fireplace and tables. Our North Adelaide location was just a short stroll from a number of great restaurants on O’Connell Street. 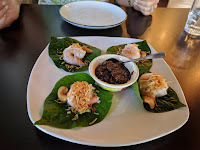 We dined first at Krung Thep, a top-notch Thai restaurant that drew us in with a promise of nice, cool air conditioning. The starter was a sensational coconut prawn appetizer with homemade chili sauce paired which we paired with a glass of sparkling wine. My entrée was Pad Thai, which was some of the best I’ve ever enjoyed. Our manor lodgings gave us access to all of Adelaide via the handy free city connector bus that had a stop just steps from our front door. We were able to hop on the bus for a trip to the grocery for essentials (aka chilled rosé and supplies for our backyard picnic). We also used the connector to visit the Adelaide Botanic Garden. The Adelaide Botanic Garden is amazing. And as a current TV commercial would say, it’s “free free free free.” The ABG is 130 acres of beautifully landscaped gardens, compelling architecture, dining venues and even the Museum of Economic Botany. The museum opened its gates in 1857 and it includes the quirky Santos Museum of Economic Botany. The museum is built in the Greek Revival style and opened its doors in 1881. It is dedicated to the collection and interpretation of useful plants. The stunning Bicentennial Conservatory is the largest single-span conservatory in the southern hemisphere. Wandering the paths and enjoying the water lilies, roses, spectacular trees and plants can easily fill an entire day. There is the acclaimed fine dining Botanic Gardens Restaurant overlooking the Main Lake and the Café Fibonacci for alfresco style meals and drinks. After you tire of the vegetation, the National Wine Centre of Australia is only steps away from the Botanic Garden. It features the largest wine cellar in the country as well as a great café and a wine shop that sells Aussie favorites by the bottle or glass. In one interesting display, you get your chance to be a “virtual” winemaker. Adelaide was in the midst of a historic heat wave, but it couldn’t block us from our next destination – Kangaroo Island. 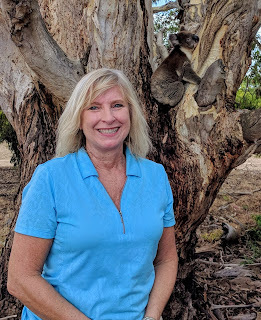 Kangaroos and koalas were calling my wife’s name. 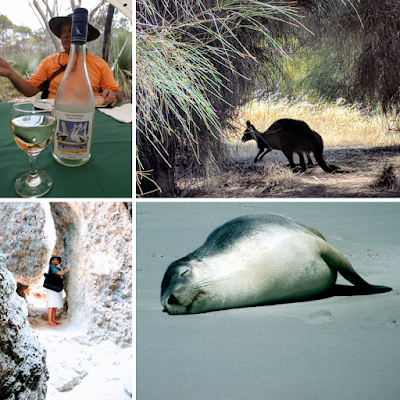 The tour provider was Kangaroo Island Odysseys, which specializes in small group tours. In many ways it reminded us of the jeep rides during our African safari. There was a total of six guests on the tour, including us. We had a two-hour shuttle bus ride to Cape Jervis where we got aboard the Sea Link ferry. The ferry is comfortable and has beverages and snacks available at the café. The trip takes about 45 minutes. Kangaroo Island is the third largest island in Australia. It’s 90 miles long and between one and 34 miles wide. The economy is mostly agricultural with honey, wool, meat and grain being produced. The island also has 30 wine growers and 12 wineries. The island is teeming with wildlife some of which can be found nowhere else in the world. Upon arrival at the island, we started a race against time. Outside the temperature was climbing with a forecast of more than 110o F. If we were going to see sea lions on Seal Beach, we had to get there quickly, since the beach closes when temperatures become unsafe for visitors. 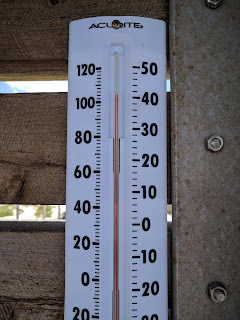 The mercury continued to climb as we arrived at the park office. Visitors were being turned away from the boardwalk leading down to the beach. Our group was able to enter since we had an experienced guide with us, familiar with safety precautions. It seemed like my wife and I consumed a case of bottled water by ourselves. More than one guest was teetering during the walk down to the beach. 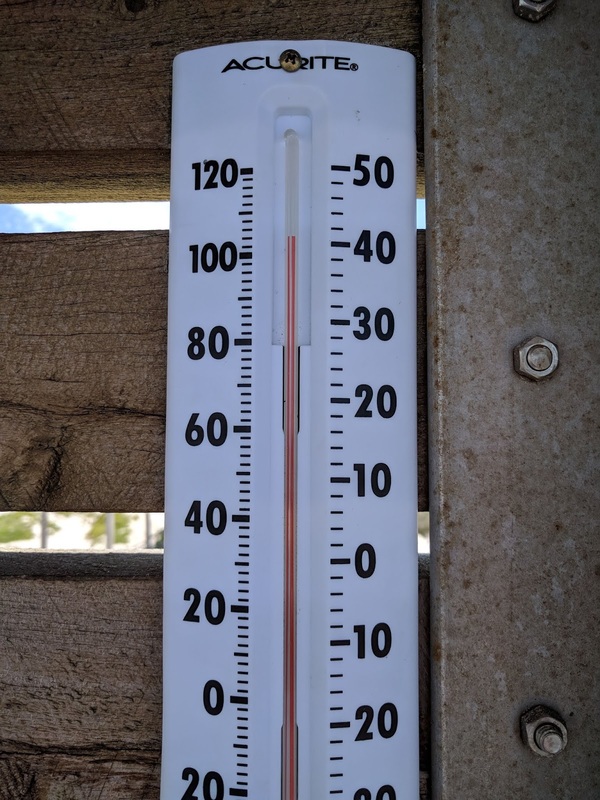 In one shaded area, the thermometer read 106 degrees. Later we would learn that Adelaide set a new record with 116 o F heat – meanwhile we spent most of the day outside in the Australian sun! We enjoyed the scenic beachfront while the rare Australian sea lions lolled around in the sand. There are about 15,000 in the world and they are only found in South Australia and Western Australia. It was a great sight, but nothing was better than enjoying an ice cream bar when we made it back to the air-conditioned park office! The island may be named Kangaroo, but we saw far more koala than its namesake marsupials. Due to the extreme heat, we saw maybe a few dozen kangaroo, but only a few close up. Surprisingly, we had outstanding luck with koala. Ninety-percent of the island is scrubland and woodland dominated by Eucalyptus trees, the leaves of which are the favorite food of koalas. We arrived at some private land just perfect for koala watching. After disembarking from the 4x4, we strolled through the high grass and it wasn’t long until we spotted the first koala in the crook of a “gum” tree. Koala are marsupials, and not “bears” of any sort. Like my college friend Dan, they sleep up to 20 hours a day. Baby koalas, called joeys, spend the first six months in their mother’s pouch. We were lucky to see several young koala during our stroll and we could get fairly close to them. We had worked up a hunger by this point and headed down the rutted dirt road for our lunch in the bush. Inside our tent, our guide had set the table for a picnic lunch. Our delicious lunch was served with a chilled bottle of Bay of Shoals Classic White an easy drinking blend of Sauvignon Blanc, Riesling and Chardonnay from a winery on Kangaroo Island. In addition to getting up close and personal with some kangaroos, a highlight of the afternoon part of the trip was a visit to a hidden beach for some splashing in the water. The beach wasn’t visible from the shore and only came into view upon squeezing through a narrow passage in the rocks. 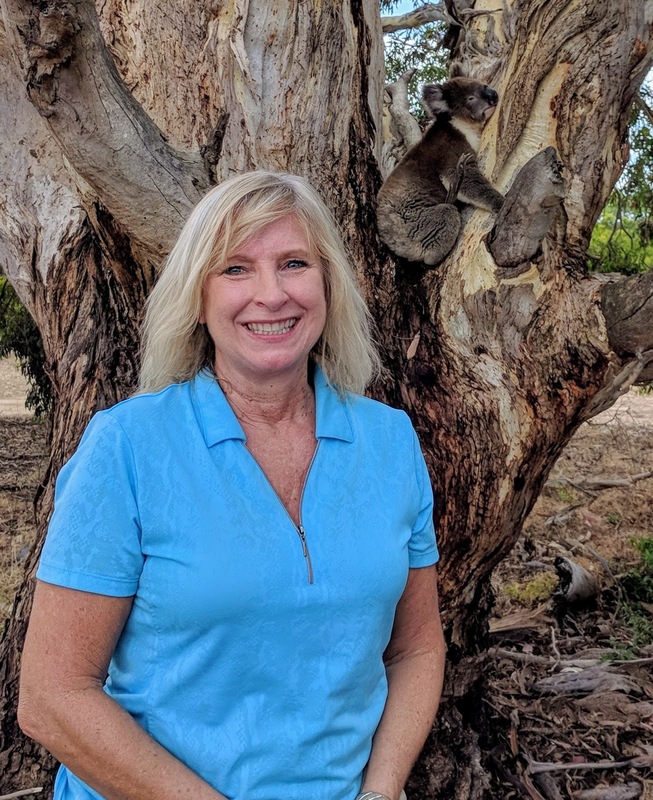 One of most astounding aspects of our trip wasn’t the sighting of the rare wedge-tailed eagle (although that was fun) but learning that two of our fellow adventurers were also from Raleigh, NC! Not only that, but one works with my wife as a volunteer with the local Red Cross. What are the odds that two couples would both take the same tour in the same place on the same day half a world away? Australia is amazing, without a doubt. 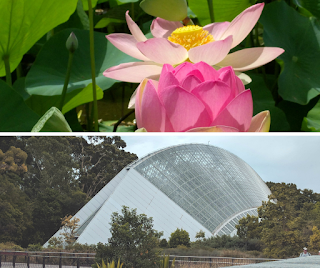 Adelaide, its Botanic Garden and the famed Kangaroo Island contribute to that allure.